Hi guys. Ended up over here from Reddit. 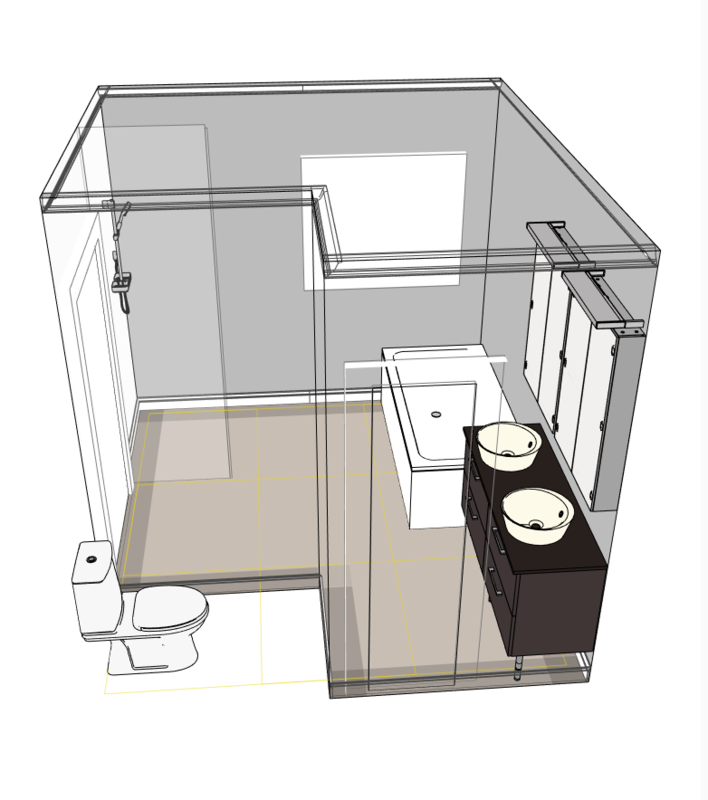 I've been planning on a master bathroom reno for some time, and with helpful in-laws and a dumpster in the driveway, the time is nigh. The bathroom is very open, but original from the 90s where large useless tubs and tiny shower stalls seemed to be the norm. 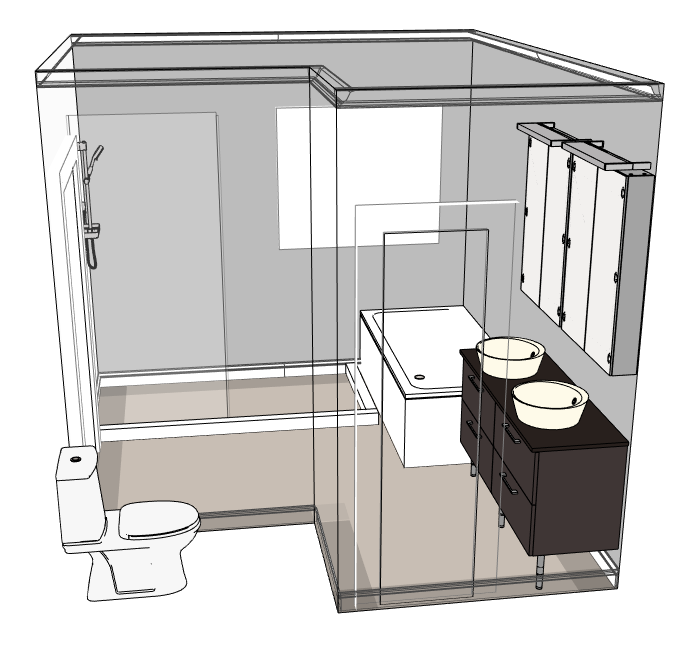 The plan is an open shower, freestanding tub, heated floors and a storage-centric vanity. All new tile, of course, and even the toilet will get swapped out. The pictures were built from Ikea's planning tools, so not all fixtures are accurate but dimensions are. Entering near the vanity from the master bedroom, and a large opening for the closet on the left. Both rooms have laminate hardwood, so I'm concerned about raising the entry/exit floor height by too much. 1) After recently freaking out about how I'm going to achieve the slope for the shower without raising the floor by several inches, I discovered the method of removing the subfloor, adding ledger boards and blocking, then adding cut plywood to be flush with the top of the joists. This will give me a 3/4" recessed area that I intend on installing a Kerdi shower pan or similar. Is this an acceptable method? 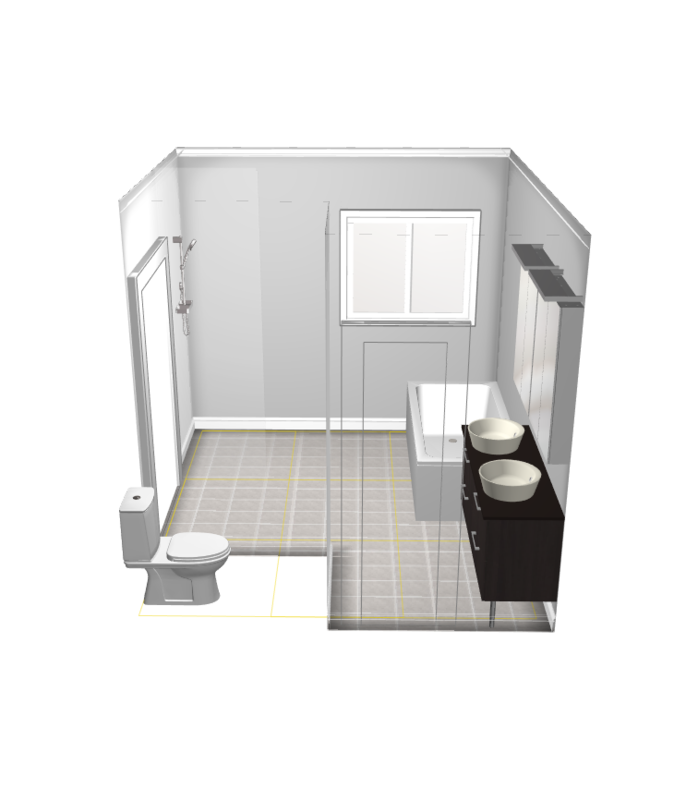 2) I'm planning on adding 1/4" backerboard for the rest of the bathroom, with a 12" gap of subfloor around the recessed shower pan to extend the slope with dry-pack mortar. This is 1 1/8" total thickness at the transitions. I'm not sure on the thickness of the laminate, assuming 1/4", but is this acceptable? 3) Where should the drain go? If I were to make this a "wet room" (which I basically am) should I add a second drain, if so where? Thanks in advance. I'm sure I'll have other questions but #1 is the biggest. I'm currently tiling the shower walls of my own curbless shower/master bathroom job, Trad. Yes, you can pull the subfloor and add cleats to the sides of the joists (I'm assuming that your joists are typical lumber, and not engineered) to recess the 3/4" plywood (and is what I did with mine). Be aware, though, that you'll then need to go over that with a layer of 1/2" ply (exterior glue/Exposure 1). Reason for that is the ply between the joists is pretty stable, while the joists themselves are not. It is also unlikely you'll manage to get the top of the ply dead even with the top of the joists all along their lengths. Also, since you are considering using a pre-sloped foam pan for the shower the floor under it needs to be darn level. The foam pans have the minimum slope of 1/4" per foot built into them so if your floor is out by even 1/8" you just cut that minimum slope by half. A foam pan of that size will likely have a 1" high perimeter. IOW, when you set the pan atop the subfloor you'll then have to raise the rest of the floor 1" to be even with the pan. While you could recess, and make level, the shower pan area only that'll only work if the rest of the floor is also level. Drain wise, I used a center drain, which would work well for you. 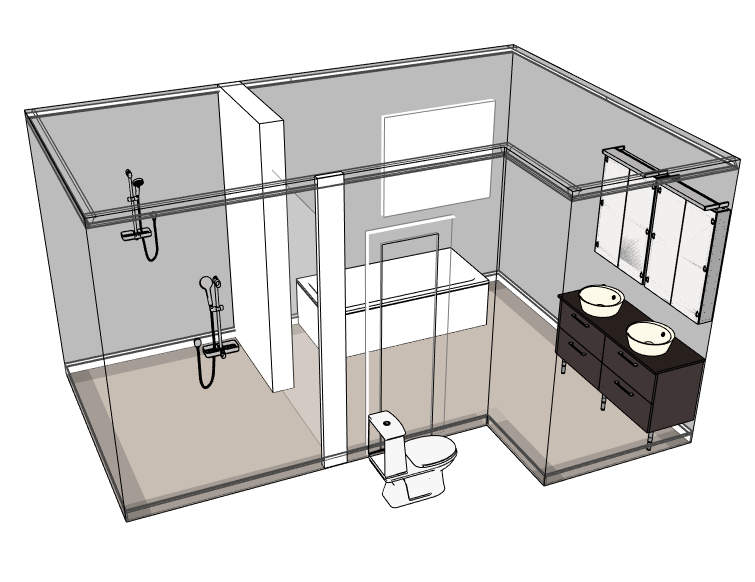 Since your tub will have to sit on a non sloped section of the floor I'd view the shower pan starting at the long front of the tub, and position the drain midway between the tub and back shower plumbing wall. I used Schluter's Ditra Heat under my floor tile. Laticrete makes a very similar product, Strataheat. Both heat mats are only 1/4" thick and can be stuck directly to plywood, which may save you some height over the product you are considering. IMO, your 3' ish long splash wall may not be long enough. If I'm reading that right, that's a lot of work for a net gain of 1/4" recess. Isn't using a premade shower pan supposed to help with that shift from the joints, versus making one from mud? I think I'd rather put a linear drain more central to the room and slope the entire bathroom and deal with the <2" threshold at the entrances. 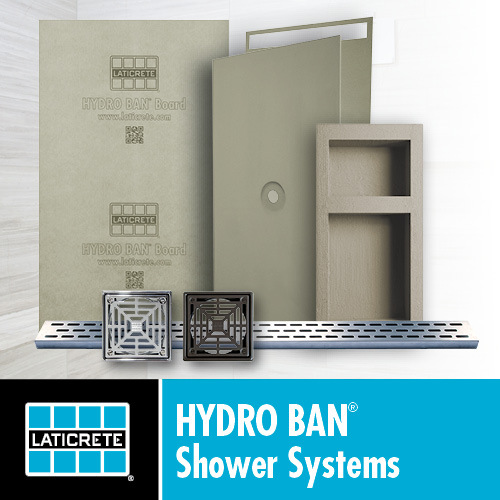 Schluter has a new system for curbless showers. A new thinner pan over the recessed plywood (but without the extra 1/2" mentioned above). It's designed to match up with Ditra Heat or Ditra XL. That’s what I was talking about. Is that an official installation by Schluter? It’s sort of casually represented but exactly what I was thinking of doing. From what I can tell it’s the same pans, just recessed. Eliminating the extra layer of ply over the recessed ply, and placing the tray directly in contact with the joists, will require some very careful construction details. If the top of a joist is proud the tray will have a hump so the joist would have to be sanded. If low, a possible weak spot that the thin tray probably won't bridge. In any case, using dimensional lumber for the ledgers presents a challenge since it's thickness can vary along it's length and is unlikely to be straight. Heck, the joists themselves may not be of uniform height, or might be twisted/leaning. Finally, the whole thing still needs to flat and level. If one levels the just the shower floor foot print, but not the rest of the floor, they might have a height issue where the two tiled surfaces meet. Not trying to rain on the parade, but Schluter's pretty picture, where all is flat, square, even, gapless, etc won't be reality. Dan, all good points. The joists would all need to be level and in plane with each other for this system to work. You could get a pretty good idea by checking the existing subfloor for flat and level before committing to this system. It's an official Schluter method. They were demonstrating it at a recent builders show that I attended. I hear ya Rich, and the system might have worked for me, had I not needed a custom sized tray. That it can sit directly on the joists (which I thought I needed to avoid) is a useful feature. Just a beef I have with "marketing" leaving out significant details. I think making sure the recessed subfloor is level is a function of verifying the joists are straight and level to each other, and then making sure the ledgers are properly spaced down 3/4". The one installation I saw had a couple spacers made from the existing plywood to verify the ledger depth, checked for level, then nailed in place. Do it all again once the recessed plywood is in place. Then the Kerdi tray is affixed with thinset, which should account for any low spots if they should exist. It's a bunch of work, and I'm really wondering if it's worth it. 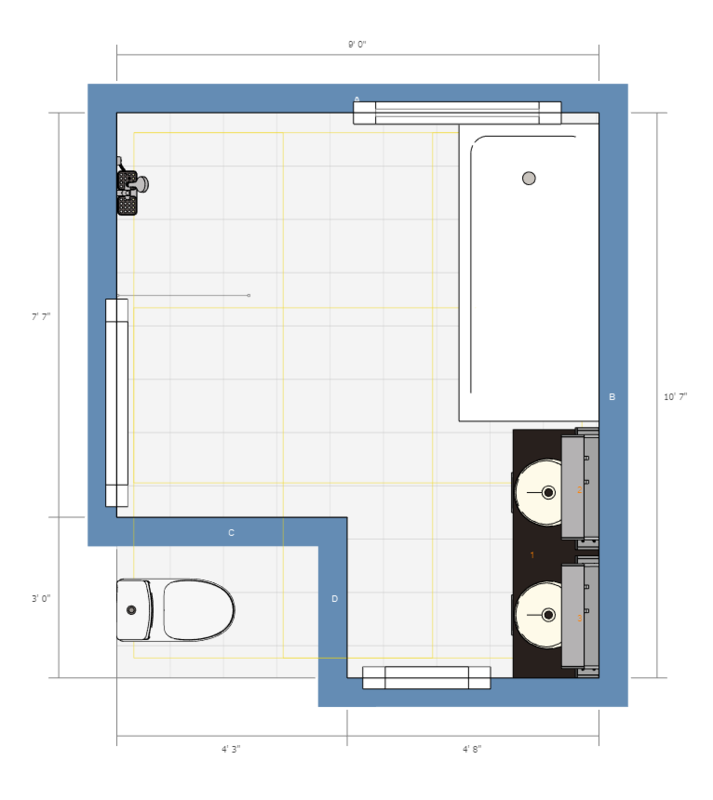 I really want to do a linear drain near center of the room, which would be a wedge-shaped pan, leaving a slope at the tile where the tub and shower 'meet'. This can be handled with Schluter Showerprofile-S but I'm trying to decide if this would look strange. I mocked up how a curb would look, and it's not bad. Infinitely easier. Just doing a simple John Bridge 3x 2x4 method. Also made the glass fixed door 36", which would be about half the length of the shower. Last night went to a dark place where I'm questioning my sanity and turning the adjacent closet into a wet room. That closet would make a heck of nice shower, and is screaming for digital shower controls. I think you're what they call an enabler.